Hamas terrorist and Gaza civilian killed by toxic gas in cross-border tunnel between coastal enclave and Sinai. Two Gazans were killed overnight in a cross-border tunnel between the Hamas-ruled Gaza Strip and Egypt’s Sinai Peninsula, officials in Gaza reported Monday. 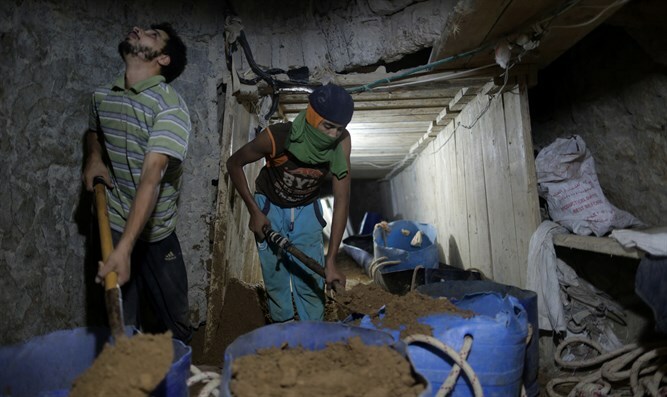 The two men were apparently killed by poison gas in the tunnel, Iyad al-Bozm, a spokesman for the Hamas regime in Gaza said Monday. One of the two men killed in the tunnel was a member of Hamas, Bozm said. The Hamas official was identified as 39-year-old Abdel Hamid al-Akker. The second Gazan killed in the tunnel was identified as 28-year-old Subhi Abu Kersheyn. Bozm did not state what the source was of the poison gas which killed the two men. There are unconfirmed reports that the Egyptian military, as part of its efforts to crack down on cross-border tunnels between Gaza and the Sinai, pumped the gas into the tunnel. In February 2017, Hamas accused Egypt of pumping poison gas into a recently destroyed tunnel, killing a group of three Gazans who were attempting to repair the tunnel. Egypt has destroyed dozens of tunnels leading from Gaza into the Sinai, flooding the tunnels or demolishing them with explosives.